In the 28 years since Lithuania gained independence, the country’s media has generally enjoyed high levels of freedom. The country’s constitution guarantees freedom of expression and freedom of the press, and those protections have been respected by successive governments. However, while initiatives by the country’s current ruling coalition haven’t seen the press attacked on the same levels as neighbouring Poland, for example, the government’s resolve is clear: the media must be reined in. Index spoke with the chairman of the country’s Journalists Union, Dainius Radzevicius about the situation media workers now find themselves in. Linas Jegelevicius: How would you rate the level of press freedom in Lithuania right now? 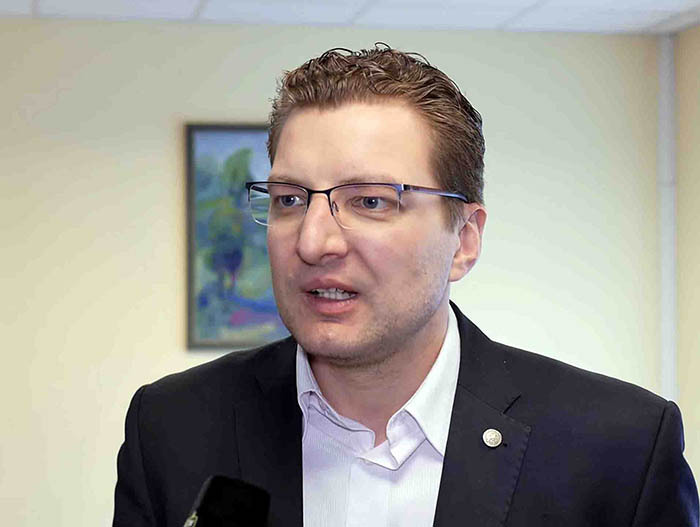 Dainius Radzevicius: The ruling Farmers and Greens Party (LVZS), in coalition with the Social Democratic Party of Lithuania, has risen to power as part of the wave of the anti-establishment parties sweeping the West. This coalition has declared the need for more regulation of the media. For example, it has attempted to push through legislation that, if enacted, would have required a 50/50 balance for negative and positive content in the media. It was proposed by the MP Dovile Sakaliene, but she withdrew it after a public outcry. Another MP from LVZS, Robertas Sarknickas, has sought tougher legislative action against the so-called “romanticising” of suicides (he believes that media shouldn’t specify how a person died). Initiatives by the ruling party aimed at regulating media are undoubtedly the biggest concern for journalists. It is likely that we will see more initiatives of this kind in Lithuania. The second threat to media freedom in Lithuania stems from the determination of authorities, especially those at the municipal level, to control the information that reaches local readers, viewers and listeners. I see journalists being increasingly barred from accessing certain events, such as those held in state institutions. Recently, journalists in the Gargzdai municipality were denied the right to attend a meetingwith the municipality heads and the prime minister, Saulius Skvernelis. It is an abnormal situation when the mayors’ advisors are given exclusive access to information. The mayor’s advisors video-streamed the meeting and posted the news on Facebook. This is an increasing trend in Lithuania, where journalists are being bypassed in the preparing and disseminating of information. Thirdly, I see the trend of journalists being too complacent with the position of the publishers and the structures behind them and tend to avoid criticising certain political and business entities and so on. In doing so, they feel safe job-wise. This self-censorship is especially prevalent among older, as well as young, inexperienced journalists. Jegelevicius: Do you foresee more threats to media freedom in Lithuania in the future? Specifically, are there any controversial legislative initiatives on the agenda in the upcoming autumn session of parliament? Radzevicius: Those initiatives tend to pop up out of the blue as a rule. From what I can see, after reviewing the autumn session draft agenda, there is a draft law on state support for the media, the intention of which is rather obscure so far. I am concerned that state authorities will be entrusted with the distribution of funds. Being aware of the processes, I just cannot rule that out. If this happens, it will deal another big blow to media freedom in Lithuania. I especially worry that freelancers and independent media content producers would be affected by it. The model of state support that existed until now was not ideal, but it was pretty fair, including to freelancers. Jegelevicius: There have been several cases of closure of Russian TV news channels by Lithuanian authorities. What is your take on the issue? Does the removal of NTV Mir and RTR Planeta off the air for six months count as media violations? Radzevicius: I want to emphasise that the measures were taken after multiple violations occurred. No state puts up with warmongering and instigating of enmity and disseminating of propaganda. The repetitive violations by the Russian TV channels were reviewed by different Lithuanian media supervision bodies, as well as by the European Commission, before the decision was made to shut them down. Note that suspension of the broadcasting is for a limited period (6 months), after which the channels can resume the license. A big portion of their content had very little to do with journalism – the local viewers were awash with propaganda ordered in Moscow. Many problems of the kind would be solved if all the states, including Russia, would pass laws and ratify international conventions that would allow journalists to work independently and bar states from using journalists as propaganda tools. Jegelevicius: How does Lithuania compare with other European countries in terms of press freedom? Radzevicius: We indeed have very few violations but I believe some go unreported. With 28 years as an independent state, the majority of the ruling coalitions have understood the importance of media freedom to democracy and to the checking of legislative, judicial and governmental powers in the country. The fact that the parties tend to change after serving their term in Lithuania has also been an important factor for media freedom. Jegelevicius: Lithuania holds municipal council, presidential and European Parliament elections next year. There is a worry that unfriendly states such as Russia will meddle with them, including attempts to influence the media. Financially unstable media outlets are especially prone to such acts. Will the authorities step in and regulate the process during the sensitive election period? Radzevicius: I have no doubt that our state authorities, including the State Security Department, are very well aware of what to expect. Indeed, we live in a small country with a pretty small media market, all of which makes it easier to monitor what is going on. From the point of view of journalism, transparency is the best remedy to guarantee that the elections are violation-proof.